Let’s face it, business leaders and safety professionals all play the same game: Maximising profits, without establishing or endorsing operations that will cause harm to their workers or the public. Due diligence is about collecting information to allow informed decisions to be made. As such, workplace prosecutions are something that health and safety practitioners, and business leaders alike, should maintain currency of to identify trends and ensure past situations are not repeated. For the third year in a row, Action OHS Consulting has taken some time to collate and review the data available from WorkSafe Victoria and SafeWork NSW to support you in influencing key stakeholders within your organisation and assisting your business to make informed decisions with respect to its health and safety program. This article provides an overview of the prosecutions for 2015, 2016 and 2017 calendar years. 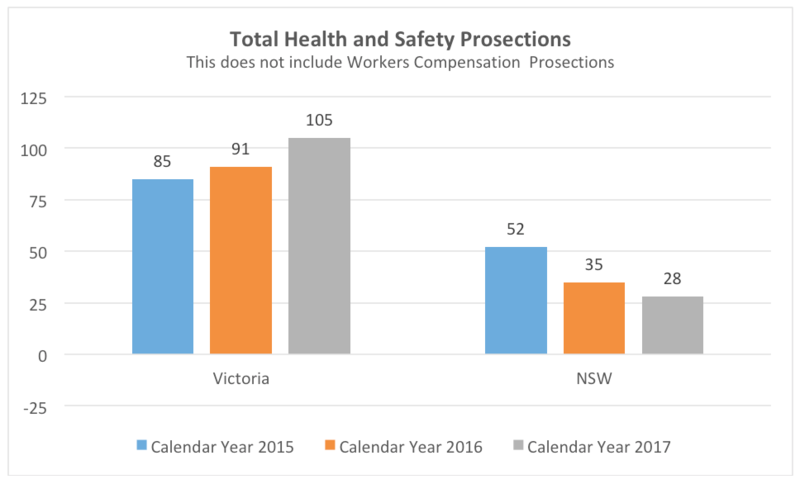 Calendar year 2017 saw a total of 105 prosecutions against the Victorian health and safety legislation, whilst in NSW the number of prosecutions was 28. When the past three years are compared, there has been a 23% increase in Victoria. Whilst over the same period, there has been a 46% reduction in the prosecutions that have occurred in NSW. Whilst 2017 saw the introduction of the updated Occupational Health and Safety Regulations 2017, with prosecution timeframes on average over 2 years, the outcomes from prosecutions against the updated regulations are likely to become visible from 2018 and beyond. 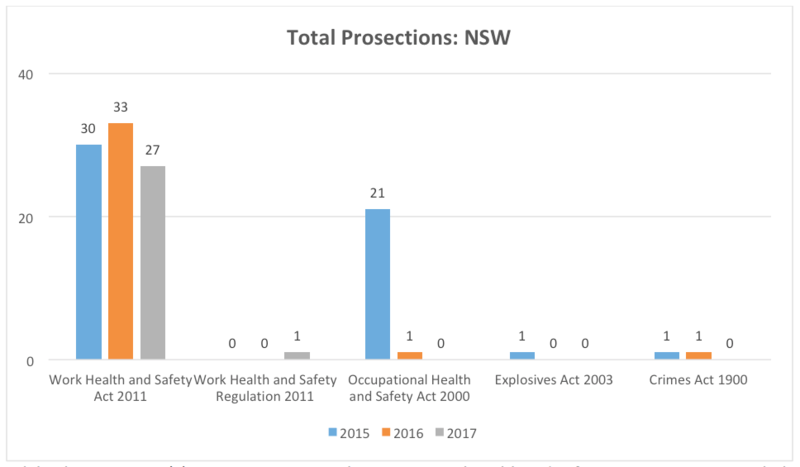 Whilst there was one (1) prosecution against the Occupational Health and Safety Act 2000 in 2016, with the maximum timeframe for prosecution outcomes in 2017 being 3 years and 11 months – this may signal a complete transition in NSW to prosecutions against the harmonised legislation, following the 2000 Act being superseded as of 1 January 2012. The timeframe for the prosecutions outcomes from 2017, when measured against the date of the offence, have been listed in the table below. Table 1: Timeframe between date of offence and the prosecution outcome, for the 2017 prosecution outcomes reported by SafeWork NSW & WorkSafe Victoria. Year on year, the average fine and median fine increased in NSW. 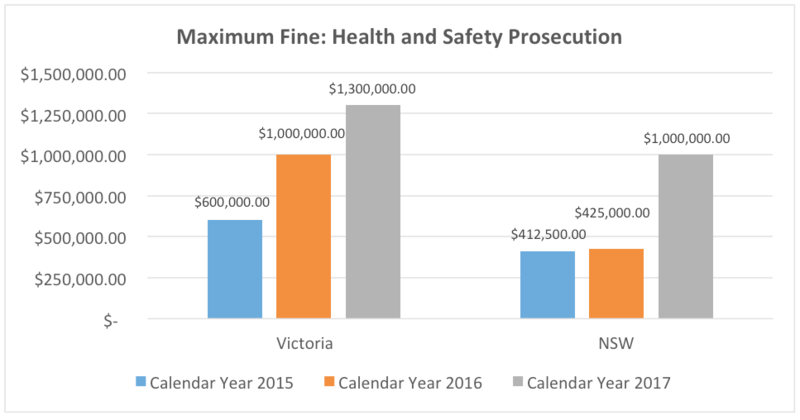 Whilst in Victoria only the median fine increased with the average fine staying around $85,000. 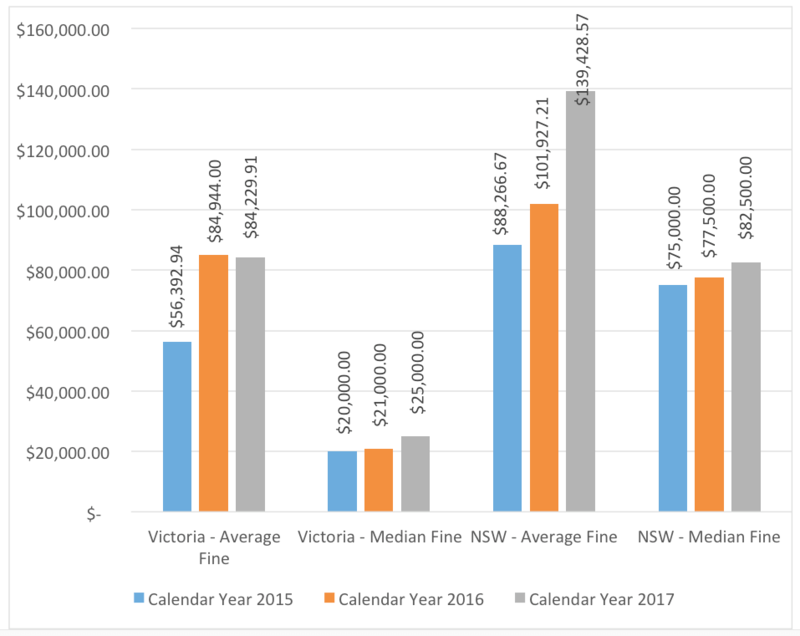 The average and median fines were greater in NSW. In NSW each prosecution resulted in a monetary fine. In Victoria 88 fines were issued (83% of prosecutions). When considering total costs (e.g. court costs, court funds, etc.) all prosecutions were financially impacted. In addition to the fines, WorkSafe Victoria issued 10 Enforceable Undertakings in 2017 which equates to 10% of prosecutions. This is compared to the 6 and 7 issued in 2015 and 2016 respectively. An Enforceable Undertaking is a legally binding agreement between WorkSafe Victoria and the employer. The employer is obliged to carry out the specific activities outlined in the agreed undertaking. EUs will typically guide and direct the business being prosecuted to improve its health and safety program. During asphalt resurfacing works, a company engaged a traffic control company to perform the traffic management operations at the workplace and a separate company to supply a sweeper vehicle and driver for the resurfacing works. A traffic management worker was struck and killed (as they were aligning bollards to separate live traffic from the resurfacing) by the sweeper vehicle when it breached the exclusion zone and reversed into him without warning – Victoria: $1,300,000. The background: The sweeper vehicle had previously narrowly missed two workers at the workplace on two separate occasions when it breached exclusion zones without warning. The sweeper vehicle was driven in reverse in the work zone when unnecessary and persons on foot at the workplace were unaware of the movements of the sweeper vehicle. Spotters had been provided for other mobile plant operating in the area but no spotters were assigned to the sweeper vehicle. The offender’s induction to the workplace did not address the dangers posed by the sweeper vehicle reversing on a busy site and there was no Safe Work Method Statement setting out safe procedures for moving or setting up bollards. The offender also failed to supervise effectively, or at all, the operation of the sweeper vehicle and the movements of persons on foot in the vicinity of the sweeper vehicle. The outcome: There is a requirement to supervise and manage contracted parties. In this instance, there was a risk of death or serious injury as a result of the unsafe operation of the sweeper vehicle at the workplace. On 19 June 2014 a worker suffered serious injuries following an electric shock as a result of working in close proximity to high voltage overhead power lines – NSW: $1,000,000. With respect to the Victorian prosecution, it confirms the requirement for organisations to supervise and manage the work of contracted parties, and their interactions onsite. 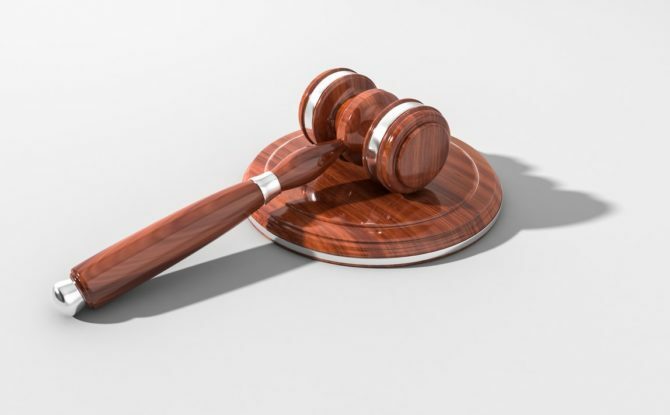 In this case, the court found the primary contractor should have had more control over the day-to-day supervision of the work activities, and reviewed Safe Work Method Statements. The management of contractors will vary between contractor engagements, and will depend on a number of factors. One thing is certain, you must have a clear management plan. If you are not sure what this plan looks like in your organisation, this outcome suggests that you should seek advice. If you were of the belief that health and safety prosecutions were limited to corporations – think again. In 2017, 3% and 19% of prosecutions were issued to workers in Victoria and NSW respectively – equating to 3 and 5 prosecutions respectively. This is a reduction in the distribution of worker related prosecutions from 2016. Worker suffered serious head injuries when he fell approximately 11 metres while lopping a tree – NSW: $80,000. A worker was fatally injured when he came into contact with the tracks of an excavator at a waste sorting facility – NSW: $60,000. Note: The corporate defendant was fined $300,000. A visitor to a residential property suffered serious burns when an explosion and fireball occurred as a result of bitumen laying works – NSW: $40,000. Note: The corporate defendant was fined $160,000. A 20 year old labourer fell approximately 11 metres off a roof of a house after being hit by a swinging branch cut from a tree, suffering a fractured shoulder from the fall – NSW: $20,000. A SafeWork NSW Inspector observed a worker operating a forklift without wearing a seatbelt (at Flemington Sydney Markets). The worker was issued with a Penalty Notice for failure to wear personal protective equipment (being a seatbelt) – NSW: $1,000. A company secretary and shareholder with a 21 year old apprentice were unloading floor sheeting which had been craned onto the second floor trusses of a partially constructed apartment building. The trusses collapsed onto the first floor, with both floors collapsing to the ground. The apprentice was fatally injured. There was no safe system of work for unloading the sheeting onto the second floor trusses to determine whether those trusses were capable of bearing the load – Victoria: $180,000. An incident was reported to WorkSafe. That afternoon two Inspectors and one Investigator attended the site. During the course of their visit, the offender gave a wrong name to an Inspector, hindered an Inspector by refusing to answer relevant questions, acted in an intimidating and threatening manner by aggressively striking metal with a hammer, saying he hated them and made threats of violence, pushed an Inspector, and ordered the Inspectors to get out of the workshop. The offender was charged with offences related to assault, intimidation and hindrance/obstruction of an Inspector and providing a false name to an Inspector – $1,000.00 and ordered to pay costs of $3,038.05. 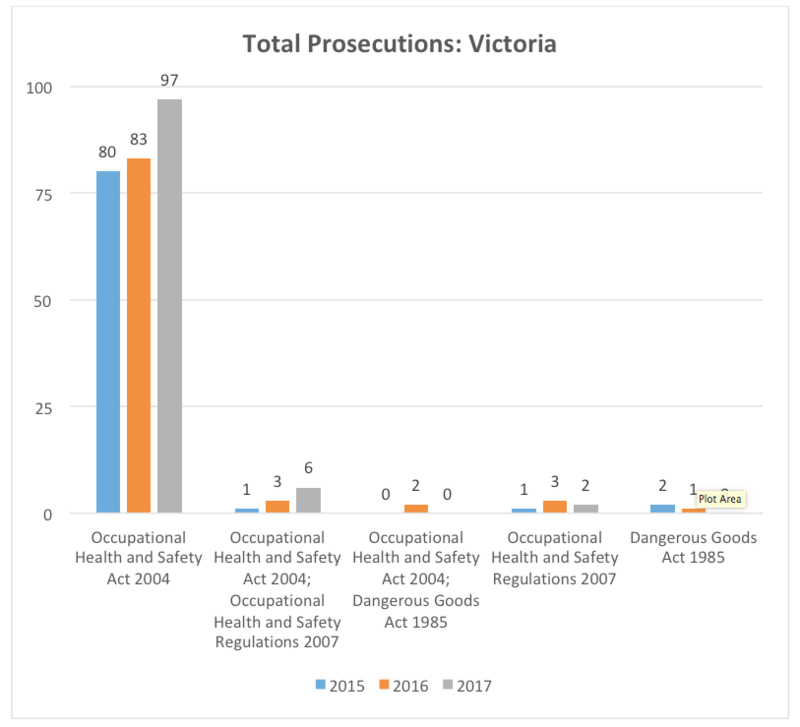 With respect to the criteria/codes that lead to the prosecution – the criteria that was associated with 10% of the prosecutions in 2017, as defined by WorkSafe Victoria, are outlined below. These criteria are consistent with 2015 and 2016, with the exception of “Failure to notify VWA of a notifiable incident” being associated with 16% of all Victorian health and safety prosecutions in 2015 and “Unguarded plant” and “Failure to conduct a risk/hazard identification” being included on this list in 2016, being aligned with 14% and 12% of all Victorian health and safety prosecutions. The introduction of “Failure to provide a safe workplace” places a clear duty on workplaces to understand their operations, the hazards associated with their work, and ensure that the established controls are implemented. In addition, the increase in “High risk construction work” along with with “Falls/work at height offences” aligns with WorkSafe Victoria’s focus on high risk industries. “Inexperienced employee” returning to the list after no being included in 2016 at 6%. This should not be limited to just “young” workers. During 2017 and into the first-half of 2018, Action OHS Consulting did observe a rise in inbound calls for support, associated with improvement notices being issued by WorkSafe Victoria regarding these three criteria. Assess their workplace risks. Consider listing all foreseeable hazards in the workplace, and document the current controls that have been established by your workplace. If “all” seems too hard, try and select the “Top 5” hazards – with respect to their potential to cause serious harm. List the controls that you have in place. Speak internally and look externally, is there anything that has been missed, or something that others do? Yes? Document the additional control strategies into an Action Plan and plan how these can be implemented into your operations. Establish an induction program. This may include a “buddy” being assigned to “new” and/or “young” workers. Ensure the induction includes an overview of your safety program and the operational activities that the worker will undertake. Consider safety when engaging contractors. Workplaces often engage contractors to support processes that the workplace is not familiar with, which often means new hazards are introduced to the workplace. Prior to engaging contractors, along with price, seek information from those you are about to engage to understand how they will maintain that safe working environment that you have established. Let them know what you need them to do, and ask them what they need you to do, to help them be safe while working with you. Ensure your implementation is sustainable. Don’t rely on just one person. Spreadsheets and folders can be effective if you are organised, however, are difficult to maintain visibility when tasks are due – or more importantly, when tasks are missed. Web-based platforms such as Safety Champion Software will support visibility of your health and safety program, guide and remind you when deadlines and key milestones approach. Consider safety as part of your procurement process. Before you buy anything, consider the safety implications. Don’t limit this to equipment, machinery, computers – extended this to services as well. Don’t make safety an afterthought. We would be interested to hear your thoughts, questions or fears. If like us, you would like to interrogate the data on prosecutions, we would be more than happy to share an unlocked copy of the data with you – simply Contact Us. Alternatively, send an email to info@actionohs.com.au, or phone 1300 101 OHS (647) explaining you’d like a copy of the prosecutions data.